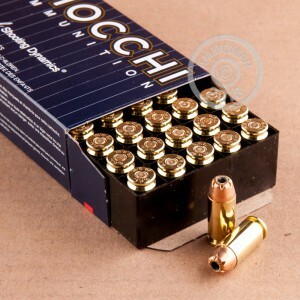 Load up your handgun with this high performing self defense ammo from Italian leader Fiocchi. These 40 S&W jacketed hollow point rounds will not let you down when you're fighting off an assailant. The 165 grain weight bullet delivers the expansion you need to stop them in their tracks. This product is loaded with similar grain weights as Fiocchi's Exacta line, but for a much more affordable price. You can stock up and practice as much as you want without breaking the bank. For those interested in ballistics, the muzzle velocity of this ammo is 1100 feet per second and muzzle energy is 443 ft. lbs. Your 50 rounds will be delivered to you in brand new condition. The Boxer primed brass casing are reloadable and non-corrosive. 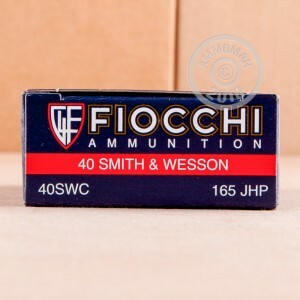 Fiocchi Shooting Dynamics ammunition provides great quality and consistency for the high-volume shooter. Most of Fiocchi's ammunition is loaded at their plant in Ozark, Missouri. They also import ammo and reloading components from their plant in Italy. The company is still family owned.